Can There be Harmony in Health Care Teams? Here is a picture that I believe conveys charm, grace, harmony, happiness, a joy of being alive. 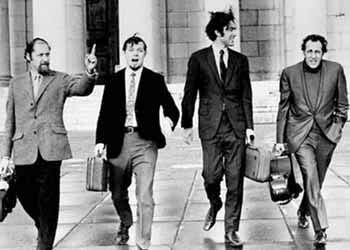 This is the Guarneri Quartet in Munich, in 1969. Can you conceive of a similar picture for a group of four health care professionals? Say, a neurosurgeon, a family physician, a nurse, and a physiotherapist? I cannot. Unless I imagine that they are very good friends coming out of a conference presentation, exhilarated by the applause they received, and now on their way to celebrate somewhere nice downtown. Why is it that I have to push my imagination a bit harder for a group of health professionals than for a group of musicians? My own feeble imagination is a possible answer. But that aside, I believe that there are significantly more pictures of groups of joyful musicians than of health care professionals. I think this is a testable hypothesis. I have not done the work. But I am willing to bet on it. I am also willing to bet that we will find more harmonious, seamless, and effective teamwork performance among musicians than among health care professionals. My own self-criticism would then go full speed when I realize that the Guarneri Quartet is particular in many ways: a very successful quartet, a group with an exceptional longevity, good-natured in their mutual relationships, and with a deep and abiding respect for each other. How frequent is that among musicians? This is I think precisely the logic behind the empirical research conducted by Whitehead et al., published in the current issue of JRIPE, Vol 4, No 1 (see http://www.jripe.org/index.php/journal) on what health care professionals can and cannot learn from musicians. The authors recommend that we go beyond the charm of the idea that highly effective health care teams can evoke the performance of a music orchestra. Instead, they advise “we must understand the work that musicians put in and the difficulties that they face. Just as any other team, a chamber ensemble struggles to develop effective collaboration“. The comparison between music and health care must take into account the differences in the structures and the language of the two systems. Constructs that apply to one may not be relevant to the other. The authors’ main finding is three-fold: musical groups have highly individualized identity; they have a deep understanding of the importance of non-melodic parts in music; and they interact differently in rehearsals and in a live performance. What follows is that a focus on generic interprofessional education skills may be insufficient, perhaps even misleading; the possibility of nuanced leadership models; and the need to take into account the variety of forms of group interactions in everyday health care practice. As we look forward to a deeper understanding of the differences between the two, I like the charm of the idea of comparing the two. Take for example the lovely sound of a Schubert Concerto for violin and orchestra in D major: https://www.youtube.com/watch?v=zlNI1DVjjtE; or for a smaller group, take the Rondo for violin & string: https://www.youtube.com/watch?v=fqGj4stf6bE. Watching these performances, I cannot help but wish we could have something similar among health care teams; something that conveys high levels of charm, grace, harmony, happiness, and the joy of being alive—all human aspirations that make life worth living.